Reference Publication: Lombardi, Matthew, Parker, Danny, Vieira, Robin, Fairey, Philip, "Geographic Variation in Potential of Rooftop Residential Photovoltaic Electric Power Production in the United States," Proceedings of ACEEE 2004 Summer Study on Energy Efficiency in Buildings, American Council for an Energy Efficient Economy, Washington, DC, August 2004. This paper describes a geographic evaluation of Zero Energy Home (ZEH) potential, specifically an assessment of residential roof-top solar electric photovoltaic (PV) performance around the United States and how energy produced would match up with very-efficient and super-efficient home designs. We performed annual simulations for 236 TMY2 data locations throughout the United States on two highly-efficient one-story 3-bedroom homes with a generic grid-tied solar electric 2kW PV system. These annual simulations show how potential annual solar electric power generation (kWh) and potential energy savings from PV power vary geographically around the U.S. giving the user in a specific region an indication of their expected PV system performance. Using the energy simulation software EnergyGauge USA ( EGUSA), we simulated annual PV power generation in all 236 TMY2 sites giving us clear information on how PV production varies throughout the U.S. In changing the TMY locations we applied utility rates to fit each particular state’s average utility costs for both natural gas and electric. We assumed natural gas for all low-grade thermal heating applications (space heat, hot water, cooking, dryer) as these end-uses are not thermodynamically appropriate for high cost solar electricity. Within the analysis, net metering was assumed so that revenues from PV generation were valued at the same rate as energy supplied by the utility. Although time-of-day pricing would likely make the PV look even more attractive in applicable regions, laws preventing net metering in some locations would make PV look less favorable. Analysis spanning over two decades has shown that solar energy has greatest merit when applied to buildings, which have been made very energy efficient (e.g. Balcomb, 1980; Parker and Dunlop, 1994). More recently Zero Energy Home designs have demonstrated the potential for energy self-sufficient residences when very high levels of efficiency are matched with solar hot water and solar electric power production (Parker et al, 2000). Accordingly, two generic highly efficient homes were simulated in all locations to see how solar electric power production matched up with the building loads with the two progressively more efficient designs. This allows a geographic assessment of ZEH potential. Comparison with a standard highly efficient home shows the increasing value for efficiency. A detailed hourly building energy simulation, DOE 2.1E, was used to assess the hourly energy use and energy cost. 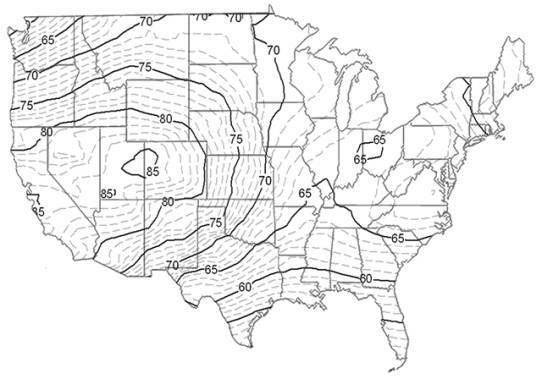 DOE-2 predicts the hourly energy use and energy cost of buildings given hourly weather data, a detailed description of the building, its HVAC equipment and the prevailing utility rate structure (LBL, 1984). The utility cost rates where provided by the Energy Information Administration (EIA) , created by Congress in 1977, and are a statistical agency of the U.S. Department of Energy. These rates represent data from 2001 average price delivered to residential consumers by state. The simulations were performed on an hourly time step with results compiled on an annual basis (8,760 hours). Typical Meteorological Year data (TMY2s) were used for all locations. A specifically enhanced implementation of the software, EnergyGauge USA was used for the analysis. This program has been validated in its predictions of cooling electric demand in three carefully characterized homes in Central, Florida (Fuerhlein, 2000). Two generic efficient homes were used for this analysis. One was designed as a highly efficient prototype and would represent current day best energy efficiency practice similar to that within the Building America Program (www.buildingamerica.gov). These prototypes were configured so they could be considered energy-efficient when moved throughout the U.S. Both buildings are similar in dimensions having 2,000 ft 2 of conditioned floor area with an attached garage. They differ in insulation values, cooling efficiencies, lighting characteristics, infiltration, tightness and water heating technologies with the Prototype ZEH as more efficient. Tables 1 and 2 summarize the key efficiency specifications for these two homes used for our analysis. Changes to the ZEH prototype are shown in bold typeface in Table 2. The photovoltaic (PV) solar electric generation system is a grid-interactive system producing DC current that is inverted into AC current and then directed to the local utility feeder. The PV generation system is a typically sized system with the aim to provide power that would offset much of household electrical loads. The PV Form (Menicucci and Fernandez, 1988) simulation model incorporated in EnergyGauge USA provided an estimate of the PV array electrical output. Based on the predicted loads for a peak day, a 185 sqft 2kW solar array was selected. The entire array would face south located on a roof at a 5/12 pitch (23 degrees) to favorably utilize solar radiation. Siemens SP75 solar modules were selected for the evaluation. These single crystalline modules have a maximum power rating of 75W each making a total of 2025W for the system at standard operating conditions. A Trace U2512/24/32/36/48 2.5 kW AC power inverter was selected to convert the DC power from the array to alternating current. Table 3 summarizes key parameters for the PV and inverter data used in the PV Form simulations within EGUSA. Mismatch and line losses are the sum of all wiring losses throughout the PV system, expressed here as a percent fraction. The efficiency reduction coefficient is the rate at which the PV module’s efficiency decreases with increasing array temperature ( ◦C). Thus, PV systems in cooler clear climates will perform somewhat better than similar solar conditions in a hot climate. 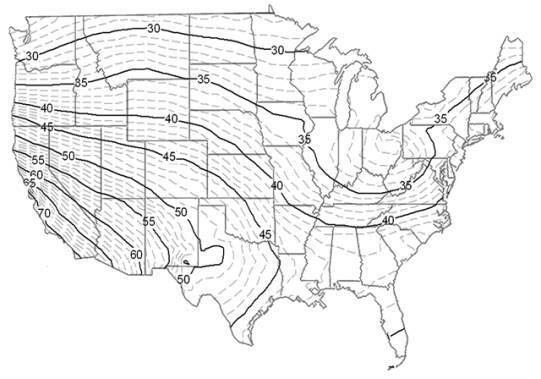 Hourly weather data used for the simulation was taken from the User’s Manual for TMY2s Typical Meteorological Years derived from the 1961-1990 National Solar Radiation Data Base (NSRDB). TMY2 is a data set of hourly values of solar radiation and meteorological elements for a one-year period. It consists of months statistically selected from individual years and concatenated to form a complete year. The intended use is for computer simulations of solar energy conversion systems and building systems (Marion and Urban 1995). We evaluated the data from the simulations in all TMY2s locations summarizing by city and state. Table 4 shows the combined total of all estimated annual loads for the ZEH in kWh and therms with PV listed in kWh of power produced. The PV offsets the electric costs by sending power back to the grid-interactive system. Estimated combined electric and gas costs are listed to show the effect of state-level average utility charges for fuels. Annual PV power produced (kWh) and savings are also listed by percent electric and percent total cost to show how much the PV contributes in offsetting energy loads and costs for each site. Based on this analysis, an average of the calculated percent of total energy cost was taken for both simulated homes. The average percent of total energy cost provided by the PV system for all locations is 37 percent for the ZEH, but only 27 percent for the highly efficient home. Thus, making key efficiency improvements can significantly improve the fraction of energy that typical PV systems provide. For the ZEH prototype the 2kW PV array produced 44-106 percent of electrical needs around the continental U.S. (average is 69 percent). Similar values for percent of total energy cost produced varied by 25-88 percent with an average of 39 percent. On a state-by state basis, the concept loads are particularly attractive in California with its low space conditioning loads and good solar availabilities. 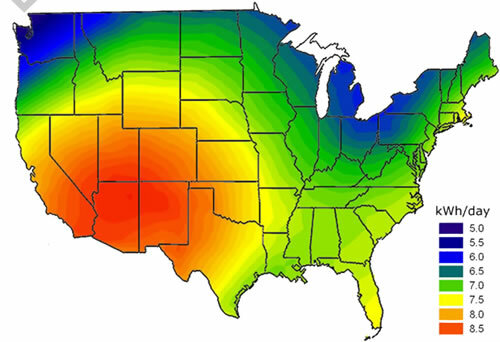 Geographic Variation of PV Power Production Around the U.S. Using data from the annual simulations we created contour plot graphic representations of the estimated PV power produced throughout the U.S. The resulting performance contours are shown in Figure 1. Note that daily average PV power production varies from 5.5 - 9.0 kWh around the U.S. with best performance in the western states. The lowest levels are seen in the Pacific Northwest although the data show PV has good performance levels across most of the nation. Similarly, Figures 2 and 3 show the percentages of annual electricity and total energy cost requirements for the ZEH home met by the generic 2 kW rooftop PV system. Note that even a modestly sized 2 kW PV system will provide 48% or more of electrical energy requirements for the ZEH home anywhere in the U.S. and 25 - 70% of total energy costs outside of Alaska. We performed annual simulations for 236 TMY2 data locations throughout the United States on two highly-efficient one-story 3-bedroom homes with a generic grid-tied solar electric 2kW PV system. These annual simulations show how potential annual solar electric power generation (kWh) and potential energy savings from PV power vary geographically around the U.S. This gives designers and builders in a specific region an indication of their expected PV performance. We found that even a modestly sized 2 kW PV system will provide 48% or more of electrical energy requirements for a super efficient home in the continental U.S. and 25 - 70% of total energy costs (except Alaska). Making key efficiency improvements from a very-efficient home to a super-efficient home permits the fraction of the home’s total energy cost met by a 2kW PV system to increase from 27 to 37%, on average. Furthermore, the same two generic prototypes were used in all locations for this analysis to show a conservative case. Better results could be accomplished by customizing the efficiency components of the home to fit that particular location. Future evaluations might consider the best ZEH designs by climate including cost information. We gratefully acknowledge support of this analysis effort from the U.S. Department of Energy’s Building America Program. Thanks also to Zeke Yewdall for coding the PVFORM simulation and to Brian Hanson for implementing the necessary features into the simulation. Balcomb, J.D., “Conservation and Solar: Working Together,” Proceedings of the 5 th National Passive Solar Conference, Amherst, MA, October, 1980. Fuerlein, B.S., Chandra, S., Beal, D., Parker, D.S., and Vieira, R.K., “Evaluation of EnergyGauge USA®, a Residential Energy Design Software, Against Monitored Data,” Proceedings of the ACEEE 2000 Summer Study on Energy Efficiency in Buildings, Pacific Grove, CA, September 2000. Marion, W., Urban, K., User’s Manual for TMY2s Typical Meteorological Years, Golden, CO, National Renewable Energy Laboratory, June 1995. Parker, D.S., Dunlop, J.P., 1994. “Solar Photovoltaic Air Conditioning of Residential Buildings,” 1994 Summer Study on Energy Efficiency in Buildings, Vol.3, p.188, American Council for an Energy Efficient Economy, Washington, D.C.